By far the coolest thing about this movie is the Halloween Hootenanny. It features Captain Clegg and the Night Creatures. These guys rock! In fact they toured with Rob Zombie last year when my wife Michele and I saw the concert at the Fillmore in Denver. The Hootenanny is what everybody would want a halloween party to be including a giant 10 foot tall Pumpkinhead! While both versions of Zombie’s Halloween were not well received by the critics and most fans, I thought they were very good. It was classic horror and had the unique spin that only Rob Zombie could master. There is talk that a Halloween 3 is in the works but Rob Zombie is adamant that he will not be a part of it. He said he has done everything he wanted to do with the franchise and is moving on the his next project: The Lords of Salem about a modern day witch tale. Should be interesting. 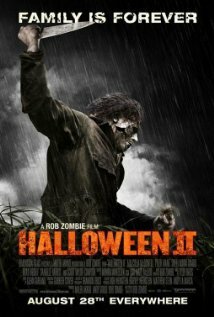 Rob Zombie originally stated he would never do a sequel to Halloween (2007), until the studio decided to make it. Then he signed on to write and direct, because he didn’t want someone to ruin his vision. Laurie has a picture of Charles Manson over her bed. Later, after Lynda’s father tries to kill Loomis, it is revealed that the gun was not loaded – just like the gun Manson follower Squeaky Fromme pointed at President Gerald Ford. This is the first Halloween movie to include Michael clearly walking around without his mask on. John Carpenter (the Director of the original 1978 Halloween) was offered a cameo in the film by Rob Zombie, but he turned it down. In fact, it is said that Carpenter was not very pleased with Zombie’s version of the story in both films. Plot: Michael Myers is still at large and no less dangerous than ever. After a failed reunion to reach his baby sister at their old home, Laurie Strode is immediately taken to a hospital to be treated by the wounds that had been afflicted by her brother a few hours ago. However, Michael isn’t too far off and will continue his murdering ‘Halloween’ rampage until he gets his sister all to himself. Next What happened between breakfast and lunch today?